Beschreibung der Dionaea Muscipula einer merkwürdigen empfindlichen Pflanze, in einem Schreiben an Herrn von Linné. 2. Auflage mit der Beschreibung einer neuentdeckten Pflanze welche ohne Grund für die Dionaea ausgegeben vermehrt von Joh. Chrn. Dan. Schreber. London, 1780. Sheet size: 21 3/16 x 31 5/16 inches. Very good. 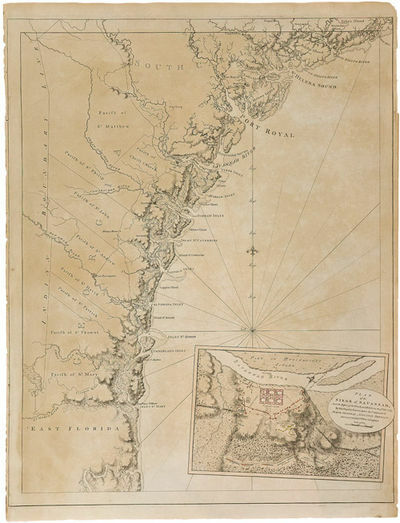 A very rare and highly important sea chart of Pensacola Harbor and northwestern Florida from THE ATLANTIC NEPTUNE, the finest marine atlas of North America's east coast, produced during the Revolutionary War. This superbly drafted map features the magnificent natural harbor of Pensacola on the Florida panhandle. Des Barres based this rendering on manuscript survey maps by British military engineer George Gauld. The town, with its fort and carefully laid out streets, is featured in the left-center of the map. Another settlement, "Campbell Town," is located further up the harbor toward the entrance of the "Scambia" (Escambia) River. The borders of various land grants are demarcated, and the countryside is elegantly detailed with aquatint features, and colored in a light brown-green wash. The chart precisely captures the features of the coast, showing how the harbor is protected by two sandy bars of land, the outer being Santa Rosa Island. 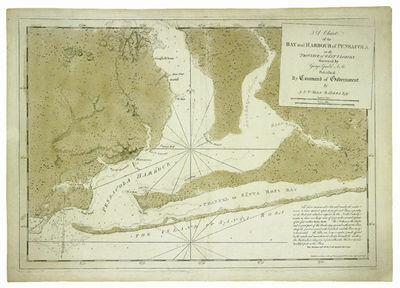 The chart features a great deal of quantitative hydrographic information, and instructions to mariners are written in the lower right of the map, ensuring that it was by far the most accurate and comprehensive pilot for the harbor produced in the 18th century. The present example is the second of two variants of this chart distinguished by the heightening of the townscapes in a brilliant red hue of original color. It is important to note that the very year that this map was printed, the region was caught up in the dramatic action of the American Revolution. The Spaniards, who had just joined the war on the American side, seized the British garrison at Fort Barrancas, and West Florida remained in their possession for the duration of the war. Joseph Frederick Wallet Des Barres was born in Switzerland, where his Huguenot ancestors had fled following the repeal of the Edict of Nantes. He studied under the great mathematician, Daniel Bernoulli, at the University of Basel, before immigrating to Britain where he trained at the Royal Military College, Woolwich. Upon the outbreak of hostilities with France in 1756, he joined the British Royal American Regiment as a military engineer. He came to the attention of General James Wolfe, who appointed him to join his personal detail. During this period he also worked with legendary future explorer James Cook on a monumental chart of the St. Lawrence River. Upon the conclusion of the Seven Years' War, Britain's empire in North America was greatly expanded, and this required the creation of a master atlas featuring new and accurate sea charts for use by the Royal Navy. Des Barres was enlisted to survey the coastlines of Nova Scotia, Newfoundland, and the Gulf of St. Lawrence. With these extremely accurate surveys in hand, Des Barres returned to London in 1774, where the Royal Navy charged him with the Herculean task of producing the atlas. He was gradually forwarded the manuscripts of numerous advanced surveys conducted by British cartographers in the American Colonies, Jamaica, and Cuba. The result was THE ATLANTIC NEPTUNE, which became the most celebrated sea atlas of its era, containing the first systematic survey of the east coast of North America. Des Barres' synergy of great empirical accuracy with the peerless artistic virtue of his aquatint views, created a work that "has been described as the most splendid collection of charts, plates and views ever published" (NMM). THE ATLANTIC NEPTUNE eventually consisted of four volumes, and Des Barres' dedication to the project was so strong that often at his own expense he continually updated and added new charts and views to various editions up until 1784, producing over 250 charts and views, many appearing in several variations. All of these charts were immensely detailed, featuring both hydrographical and topographical information, such that in many cases they remained the most authoritative maps of the regions covered for several decades. Following the completion of THE ATLANTIC NEPTUNE, Des Barres returned to Canada, where he remained for a further forty years, becoming a senior political figure and a wealthy land owner, living to the advanced age of 103. [London, 1780. Two volumes. Contemporary three-quarter calf and marbled boards, spines gilt, gilt morocco labels. Label on second volume chipped, with half the label lacking. Minor wear to bindings. Titlepage of first item stained, an occasional fox mark or some soiling, but on the whole very clean. Very good. A remarkable sammelband, bringing together fourteen scarce and important British tracts relating to the grievances of the American colonies and the prosecution of the war with the American revolutionaries. These two volumes were assembled by Francis Ferrand Foljambe (1749- 1814), a British politician and book collector, and they have Foljambe's initials and family crest at the foot of both spines. Foljambe was elected a member of Parliament for Yorkshire in 1784, High Sheriff of Yorkshire in 1787, and was a member of Parliament from Northamptonshire from 1801 to 1810. Included in these two volumes are two scarce essays by Samuel Johnson; a response to Johnson (possibly penned by John Wilkes); a rare tract by the secretary to British admiral Lord Howe; two essays by Joseph Galloway, the leading Loyalist spokesman in the American colonies; and several other works that are little-known and even less well-studied. Several of the titles defend the actions of the British Crown, others are critical of its course, but virtually all (save the Wilkes tract) are united in opposition to American independence. They range from theoretical treatises on the nature of liberty and citizenship, to considerations of the right to tax, to denunciations of the actions and arguments of the Americans. The titles, in the order in which they appear, are: 1) Johnson, Samuel: THE PATRIOT. ADDRESSED TO THE ELECTORS OF GREAT BRITAIN. London: Printed for T. Cadell, 1774. ,33pp. "The Second Edition," issued just a few weeks after the first. A scarce work by Dr. Johnson, written at the behest of his friends in the North Ministry, and strongly in defense of the Quebec Act. The Quebec Act, one of what became known generally as the "Intolerable Acts," angered an American populace already on its way to outright rebellion against Great Britain. Johnson includes a vociferous recitation of what a patriot is and is not, a part of which reads: "That man therefore is no Patriot, who justifies the ridiculous claims of American usurpation; who endeavours to deprive the nation of its natural and lawful authority over its own colonies; those colonies, which were settled under English protection; were constituted by an English charter; and have been defended by English arms." AMERICAN CONTROVERSY 74-38b. SABIN 36301. COURTNEY, p.117. FLEEMAN 74.10P/2. ROTHSCHILD 1255. 2) Johnson, Samuel: TAXATION NO TYRANNY; AN ANSWER TO THE RESOLUTIONS AND ADDRESSES OF THE AMERICAN CONGRESS. London: Printed for T. Cadell, 1775. ,88 (of 91)pp. Half title. Lacks pp.89-91. This is the first issue of the first edition (of which 500 copies were printed), with the press figure "I" on page 2. Four editions came out in 1775. Another scarce work by Dr. Johnson relating to the growing crisis in the American colonies, and containing a strong statement against American independence and in favor of colonial fealty to the Parliament. Johnson's work is a defense of the so-called "Coercive Acts" and a reply to the Continental Congress' "Declaration of Rights" of the previous year. Johnson asserts at great length the right of the mother country to tax her colonies, and wishes that the Americans "be subdued with the least injury possible to their persons and their possessions. When they are reduced to obedience, may that obedience be secured by stricter laws and stronger obligations." AMERICAN CONTROVERSY 75-69a. COURTNEY, p.125. FLEEMAN 75.3TT/1. SABIN 36303. HOWES J149, "aa." 3) AN ANSWER TO A PAMPHLET, ENTITLED TAXATION NO TYRANNY. ADDRESSED TO THE AUTHOR, AND TO PERSONS IN POWER. London: Printed for J. Almon, 1775. 63pp. Half title. A reply to Samuel Johnson's pamphlet, TAXATION NO TYRANNY. Takes Dr. Johnson to task on the question of whether Parliament has the right to tax the colonies. Howes states the author was probably John Wilkes. AMERICAN CONTROVERSY 75-5. SABIN 1657. KRESS 7068. HOWES A288. COURTNEY, p.126 (note). 4) [Serle, Ambrose]: AMERICANS AGAINST LIBERTY; OR AN ESSAY ON THE NATURE AND PRINCIPLES OF TRUE FREEDOM, SHEWING THAT THE DESIGNS AND CONDUCT OF THE AMERICANS TEND ONLY TO TYRANNY AND SLAVERY. London: Sold by J. Mathews, 1775. 64pp. Half title. Serle was a member of the Secretary of State's Office for the Colonies and private secretary to Lord Howe, admiral of the British fleet during the Revolution. This pamphlet is Serle's defense of the rightfulness of the British government's ability to tax the American colonies. He engages in a long discussion of the nature of liberty and concludes that "the Rebel-Americans, in the wildest delusion and by the worst of means, are avowing themselves the open enemies to the public and general liberty of the British Empire." AMERICAN CONTROVERSY 75-126a. SABIN 79269. HOWES S297, "aa." 5) [Seabury, Samuel]: FREE THOUGHTS ON THE PROCEEDINGS OF THE CONTINENTAL CONGRESS, HELD AT PHILADELPHIA, SEPT. 5, 1774: WHEREIN THEIR ERRORS ARE EXHIBITED, THEIR REASONINGS CONFUTED, AND THE FATAL TENDENCY OF THEIR NON- IMPORTATION, NON-EXPORTATION, AND NON-CONSUMPTION MEASURES, ARE LAID OPEN TO THE PLAINEST UNDERSTANDINGS.... New-York, Printed: London Reprinted for Richardson and Urquhart, 1775. ,50pp. Half title. First British edition, following the New York printing of the previous year. Samuel Seabury was first bishop of the Episcopal Church in America. At the outset of the American Revolution "Seabury and his colleagues began their major literary struggle to keep the colonies loyal to the Crown. His most important pamphlets were signed A.W. Farmer" (DAB). Alexander Hamilton, at age seventeen, replied to Seabury's FREE THOUGHTS... with A FULL VINDICATION OF THE MEASURES OF THE CONGRESS.... This sparked a pamphlet war between the two, which produced three more publications by Seabury and another one by Hamilton. Through the present work and other pamphlets, Seabury sought to nullify the measures enacted by the Continental Congress. "Seabury was the pre- eminent exponent of Tory thought in America" - Howes. AMERICAN CONTROVERSY 74-70b. AMERICAN INDEPENDENCE 136d. SABIN 78575. HOWES S253. DAB XVI, pp.528-30. 6) A LETTER TO THE NOBLEMEN, GENTLEMEN, &c. WHO HAVE ADDRESSED HIS MAJESTY ON THE SUBJECT OF THE AMERICAN REBELLION. 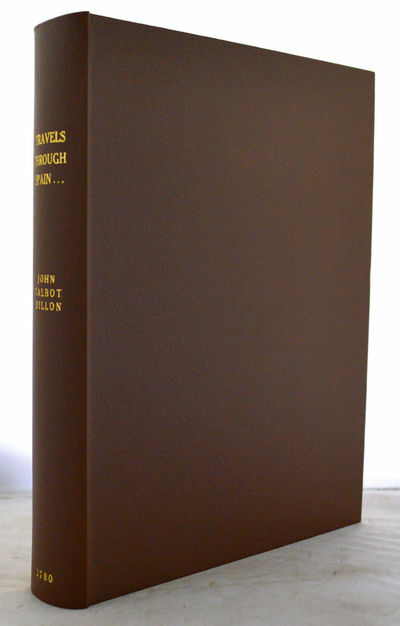 London: Printed for T. Cadell, 1776. ,37pp. Half title. Published anonymously just a few months before the American Declaration of Independence, this scarce pamphlet reviews the arguments made by the Americans and systematically refutes them. The author upholds the British government's right to tax its colonies and asserts that the rebellious Americans cannot pick and choose which laws to obey. He goes on to state that the Continental Congress "seem to be at war with reason, common sense, and the experience of mankind, as well as with the government of their country." Scarce. Adams locates only six copies. AMERICAN CONTROVERSY 76- 79. SABIN 40505. HOWES L288. 7) PLAIN FACTS, SUBMITTED TO THE COMMON SENSE OF THE PEOPLE OF ENGLAND. London: Printed and Sold by J. Jarvis, 1785. ,42pp. Hole in final leaf, affecting one word on the recto. One of the few non-Americana pamphlets in this sammelband, this anonymous tract considers the actions of the Portland Ministry, specifically with regard to the coalition of Lord North and Charles James Fox, the Receipt Tax, and the East India Bill. OCLC locates only three copies, at The New York Public Library, the Huntington Library, and the University of Wisconsin. Scarce. KRESS B929. OCLC 39221825. 8) [Dalrymple, John]: THE RIGHTS OF GREAT BRITAIN ASSERTED AGAINST THE CLAIMS OF AMERICA; BEING AN ANSWER TO THE DECLARATION OF THE GENERAL CONGRESS. ,96pp., plus folding table. Half title. 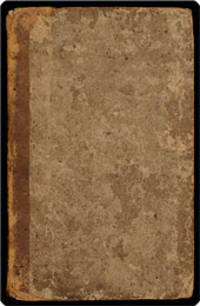 "The Third Edition, with Additions," including the advertisement leaf following the titlepage, issued the same year as the first edition. An important political tract, replying to the American Congress' "Declaration...setting forth the causes and necessity of their taking up arms," which is printed at the rear of the pamphlet. Authorship of this work is in doubt, Adams crediting James MacPherson, who was retained by Lord North as a political writer, and Howes crediting Sir John Dalrymple. The pamphlet, which was widely disseminated, sets forth the ministerial position on the situation in America. Adams locates six copies of this edition. AMERICAN CONTROVERSY 75-95e. AMERICAN INDEPENDENCE 220e. SABIN 18347. HOWES D37. 9) REFLECTIONS ON THE PRESENT COMBINATION OF THE AMERICAN COLONIES AGAINST THE SUPREME AUTHORITY OF THE BRITISH LEGISLATURE, AND THEIR CLAIM TO INDEPENDENCY. London: Printed for J. Wallis, 1777. ,100pp. Half title. First and only edition of this rare pamphlet attacking the American rebels. The anonymous author is vociferous in his condemnation of the actions and motivations of the Americans, beginning with the Boston Tea Party and the leadership of John Hancock - who is called "one of the most notorious smugglers in North America," and who was motivated to dump British tea in Boston Harbor not out of principle, but to protect his own investments. The author writes that in forty years of acquaintance with Americans "I scarce remember a single instance among the lower rank of people where they did not speak the language of rebellion," and he is especially critical of leaders in New England. Adams, ESTC, and OCLC list five copies, at the John Carter Brown Library, the Clements Library, the British Museum, the Boston Athenaeum, and the Newberry Library (though the Newberry copy is a photostat of the copy at JCB). AMERICAN CONTROVERSY 77-79a. HOWES R149, "aa." SABIN 68707. OCLC 82494005, 68099703. 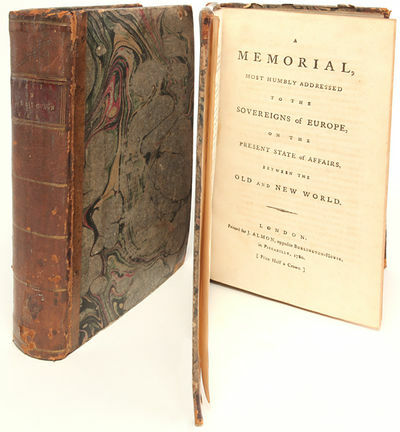 Beginning of second volume: 10) [Pownall, Thomas]: A MEMORIAL, MOST HUMBLY ADDRESSED TO THE SOVEREIGNS OF EUROPE, ON THE PRESENT STATE OF AFFAIRS, BETWEEN THE OLD AND NEW WORLD. London: Printed for J. Almon, 1780. ,viii,127pp., plus advertisement leaf for works by J. Almon bound in at beginning. A scarce work by Governor Thomas Pownall, the British colonial administrator, accomplished artist, and prolific writer. By 1780, Pownall, long considered sympathetic to the position of the American colonists, was finishing a long career in Parliament. This work discusses the importance to Europe of the American Revolution and the ideas it espoused. It also considers the political, economic, and trade consequences for the nations of Europe of an independent America. A visionary work, scarce on the market. AMERICAN CONTROVERSY 80-67a. SABIN 64826. HOWES P542, "aa." 11) [Galloway, Joseph]: PLAIN TRUTH: OR, A LETTER TO THE AUTHOR OF DISPASSIONATE THOUGHTS ON THE AMERICAN WAR. IN WHICH THE PRINCIPLES AND ARGUMENTS OF THAT AUTHOR AR REFUTED, AND THE NECESSITY OF CARRYING ON THAT WAR CLEARLY DEMONSTRATED. London: Printed for G. Wilkie and R. Faulder, 1780. vii,,76pp., plus advertisement page. Half title. This is the scarce first (and only) edition of Galloway's tract, written in response to Josiah Tucker's DISPASSIONATE THOUGHTS.... Galloway defends Britain's right to tax the colonies, discusses the importance of America to Great Britain, and refutes arguments in favor of independence. He also considers the importance of controlling the Americans in light of their alliance with France and Spain, and considers issues of trade and military readiness as well. Galloway was the most prominent American Loyalist during the Revolution. AMERICAN CONTROVERSY 80-33. SABIN 26440. HOWES G45. 12) LETTERS, TO THE KING, FROM AN OLD PATRIOTIC QUAKER, LATELY DECEASED. London: Printed for R. Baldwin, 1778. xv,,207pp. Half title. First and only edition of this scarce title. Issued anonymously, it takes the form of twenty letters to the government on affairs of state. Discussions of the American Revolution and the British prosecution of the war are included in nine of the twenty letters, especially in the fifth, "On the difficulties inseparable from a continuance of the war," and the tenth, "On the dilatory and impolitic manner in which our colonial war has been hitherto conducted." The tone of the letters is against the demands of the Americans, and in favor of bringing a speedy (but successful) end to the war, in order to lessen the strain on the British treasury. AMERICAN CONTROVERSY 78-61. SABIN 40648. 13) [Galloway, Joseph]: HISTORICAL AND POLITICAL REFLECTIONS ON THE RISE AND PROGRESS OF THE AMERICAN REBELLION.... London: Printed for G. Wilkie, 1780. ,135,pp. With passages on pp. 38 and 39 crossed out in ink, as is often the case (see Howes). Galloway was the most prominent American Loyalist during the Revolution. The present pamphlet sets forth his wish that the colonies remain with Great Britain, and how it might be achieved. As background for his case, Galloway argues that the rebellion lacked any reasonable foundation, citing the "principles and dispositions" of the first settlers of New England as the ideological source for the war. AMERICAN CONTROVERSY 80-32. SABIN 26431. HOWES G39. 14) Deane, Silas: AN ADDRESS TO THE UNITED STATES OF NORTH AMERICA. TO WHICH IS ADDED, A LETTER TO THE HON. ROBERT MORRIS, ESQ. WITH NOTES AND OBSERVATIONS. London: Printed for J. Debrett, 1784. ,95,pp. First British edition, following the Hartford edition of the same year. Deane has come to be recognized as a martyr to the American cause in the Revolution, although he died in bankruptcy, maligned and exiled. A prosperous Connecticut merchant, he went with Franklin and Arthur Lee as commissioners to France in 1778. After the signing of the French treaty he was recalled by Congress on the basis of accusations by Lee that he had taken gifts from the French and misused funds. Unable to defend himself without the necessary documents, he returned to Europe to obtain them, only to become embroiled in further difficulties when his pessimistic private letters to friends, suggesting that the Americans give up the struggle for independence, became public. His life thereafter was an attempt to justify himself from exile. This pamphlet is one of his leading self- defenses. SABIN 19064. HOWES D172. 15) REMARKS ON THE COMMUTATION ACT. ADDRESSED TO THE PEOPLE OF ENGLAND. London: Printed for T. Becket, 1785. ,81pp. The Commutation Act of 1784 lowered the duty on tea so as to remove the incentive for smuggling. The Act, supported by Prime Minister Pitt (the Younger), was designed to stimulate trade in China for the British East India Company, and lowered the tax on tea from 119% to 12.5%. The present work criticizes the act as being a windfall for the East India Company, and an oppression to the common people, who would be taxed in other ways to make up for the shortfall. KRESS B944. A fascinating collection of British tracts on the American Revolution and the philosophical issues surrounding the conflict. Carta Reducida De Las Islas De Canaria: Dedicada Al Sr. D. Fernando de Magallon Caballero del Orden de Malta, Ministro del Supremo Consejo de Indias y de la Real Junta de Comercio, Moneda y Minas, Consiliario de la Real Academia de San Fernando, y Academico del Numero de la Espanola: Por Don Tomas Lopez, Geografo de los Dominios de S. M. de las Reales Academias de la Historia, de San Fernando, de la de Buenas Letras de Sevilla y de la Sociedad Bascongada de los Amigos del Pais. Madrid ano de 1780':. Mapa De La Gran Canaria, Por Don Tomas Lopez, Geografo de los Dominios de S.M., de las Reales Academias de la Historia, de San Fernando, de la de Buenas Letras de Sevilla, y de la Sociedad Bascongada de los Amigos del Pais. Madrid ano de 1780.':. Mapa De La Isla De La Palma Por Don Tomás Lopez. Madrid ano de 1780. - Mapa De La Isla De La Gomera; Por Don Tomas Lopez, Geografo de los Dominios de S.M. de las Reales Academias de la Historia, de San Fernando, de la de Buenas Letras de Sevilla, y de la Sociedad Bascongada de los Amigos del Pais. Madrid ano de 1780.':. Philadelphia: Joseph Crukshank 12mo (16.3 cm, 6.45"). 84 pp.. 1780 [bound with] Webb, Elizabeth. A letter...to Anthony William Boehm, with his answer. Philadelphia: Joseph Crukshank, 1783. 44 pp. [with] Benezet, Anthony. In the life of the lady Elizabeth Hastings... [Philadelphia: Joseph Crukshank, 1784]. 8 pp Law's mystically-inclined meditations sold vigorously in a number of English and American editions; they serve here as the introduction to an interesting selection of Christian inspirational readings from Philadelphia printer Joseph Crukshank Â— some writers named, and some not. The Considerations on Slavery are designated simply as those of a "number of different authors"; the Remarks on . . . Liquors, which aims to promote health and happiness rather than directly religious concerns, is attributed by ESTC to Anthony Benezet, as is the volume's last piece, the title of which is taken from its opening lines. Lady Elizabeth Hastings was the original for Aspasia in Steele's "Tatler" and a major donor to Oxford University Queen's College. Elizabeth Webb, "an acknowledged minister among the people called Quakers," first encountered Prince George of Denmark's chaplain Boehm while on a visit to Great Britain; the missive with which she opened her subsequent correspondence with him, here, greatly inspired him and a number of his friends. Provenance: With inscription reading "Miss Hannah Amelia Moore / Book a Present from her worthy / Friend Ruth Patton / 1789. Contemporary quarter sheep over paper-covered sides, the whole worn and abraded but the little volume quite sound. Light age-toning, occasional darker spots. Small chip in bottom margin of title-page; one leaf with paper flaw in lower corner, resulting in the loss of a very few letters. - Feder in Braun, braun laviert, über Bleistiftskizze, auf Bütten mit undeutl. Wasserzeichen. 22.7:32,2 cm. Giani lernte in Pavia und Bologna und war 1780 in Rom. Unter dem Einfluß der Werke von Ubaldo Gandolfi, Pompeo Batoni oder Christoph Unterberger sowie durch das Studium der Antike und der älteren Malerei entwickelte er sich zu einem vielbeschäftigten klassizistischen Dekorateur. Gesamtansicht von Westen mit dem Schloß und den Gartenanlagen im Vordergrund ('Das neue Bischoffliche Residenz Schloß von der Garten Seiten anzusehen des Churfürsten von Cölln in Münster. - Le nouveaux Chateau de Münster, de S.A.E. de Cologne, Prince Eveque de Münster, de la Coté de Jardin'). Gesamtansicht von Mahon (Mahón / Maó) - ('Zweyte Aussicht von der Insul Minorrka, u. einem Theil von der Stadt u. von dem Seehafen Portmahon.'). Schloß ('Das Schloß zu Münster'). MÜNSTER. "Das Schloss zu Münster". Blick auf Schloß und Anlagen mit figürlicher Staffage. - Altkol. Kupferstich (Guckkastenblatt) von B.F. Leitzelt nach C.L. Reinhold, um 1780, 27,5 x 39,5 cm. Prächtiges Augsburger Guckkastenblatt. Im Himmel gering fleckig, sonst gut erhalten. Lambertuskathedrale - Cathédrale Notre-Dame-et-Saint-Lambert ('Prospect der grossen St. Lamberti Kirchen in Lüttich - Vue de la grande Eglise de St. Lambert à Liege'). Laubhüttenfest ('Die Stadt Jerusalem, wie darinen von den Juden das Laubhütten Fest gehalten worden. - La Ville de Jerusalem, come les Juifs y tenoient tous les ans la Fete des Tabernacles'). Innstadtansicht mit den Mineralquellen Pouhons ('Prospect von dem Plaz in Spa worauf die mineralische Brunnen Pouhon befindlich - Vue de la Place de Spa et de la Fontaine minerale du Pouhon.'). Schloß Het Loo / Paleis Het Loo ('Prospect von Loo des Prinz von Oranien Lust Schloßes - Vue de Loo la Residence et Pallais Chaimpetre du Prince d'Oranie'). Gesamtansicht ('Prospectus Portae Veteris Roterodamensis - Vista De la Puerta Vieja a Roterdam'). Winterpalais in Sankt Petersburg von der Neva gesehen ('A View of the antient Winter Palace belonging to her Imperial Majesty, and the Canal with Joins the Moika to the Neva, at St. Petersburg. - Vue de l'ancien Palais d'hiver de sa Majesté Imperiale. et du Canal qui Joint la Moika avec la Neva, a St. Petersburg.'). MÜNCHEN. "Vue du Grand Marché vers l'Eglise de Nôtre Dame a Munich". Blick über den Marktplatz auf die Frauenkirche. - Altkol. Kupferstich (Guckkastenblatt), um 1780, 27 x 43 cm. Vgl. Slg. Proebst Nr. 349. - Nordwestseite des Marienplatzes, auf dem Platz herrscht reges Treiben mit Fuhrwerken, Reitern, Kutschen, einer Sänfte und zahlreichen Passanten. Forum Argentarium Roterodami - La Lonja De Mercadores De Roterdam'). Martinstor - Porte Saint-Martin mit der Rue Saint-Martin und Rue du Faubourg Saint-Martin ('Das St. Martins Thor zu Paris welches 1674 ist erbautet worden - La Paorte St. Martin La Paris .'). Plaza Mayor ('Platea maxima Matriti, ubi Taurorum agitationes Fiune. - La grand Place de Madrid, ou on Fait la Fameuse Fête des Taureaux.'). Prospect der obern Stadt zu Quebec auf dem Plaz wo man nach dem Mühlen Cavalier gehet. - Vue de la haute Ville a Quebec avec la Place pour aller a Cavalier du Moulin'. Ansicht mit Kaiserpalast und Hagia Sofia ('Vue du Serai ou du Palais du Grand Seigneur Lit. A. et du L'Ajja Soffia ou vulgairement aujour dui L'Eglise S. Sophie Lit. B. à Constantinople, la Ville Capitale et regnante d'Empire Ottoman'). Montreal, 1780. folio sheet. Old folds. Four small pin holes. Very good. Accompanied by a typed transcription. Daniel Claus (1727-87) came to North America from Germany in 1749 and settled for a time in Philadelphia. Almost immediately upon his arrival he became interested in the various languages of the tribes of the Six Nations. He worked under William Johnson, and in 1760 was based in Montreal, becoming deputy agent to the Canadian Indians and reporting to both Johnson and the local military government. By the mid-1760s he had married and had acquired considerable land in the vicinity of Albany, New York. His life changed, both administratively and personally, when in 1774, Sir William Johnson died suddenly, and Sir Guy Carleton replaced Claus with John Campbell. Shortly thereafter, with the outbreak of the American Revolution and the subsequent defeat of Burgoyne at Saratoga, the Loyalist cause in the upper Hudson valley was lost, and Claus and his family fled to Canada, leaving behind their lands and their possessions. In 1778, Frederick Haldimand, Carleton's successor, appointed Claus deputy agent of the Six Nations in Canada, with special emphasis on the Mohawks. 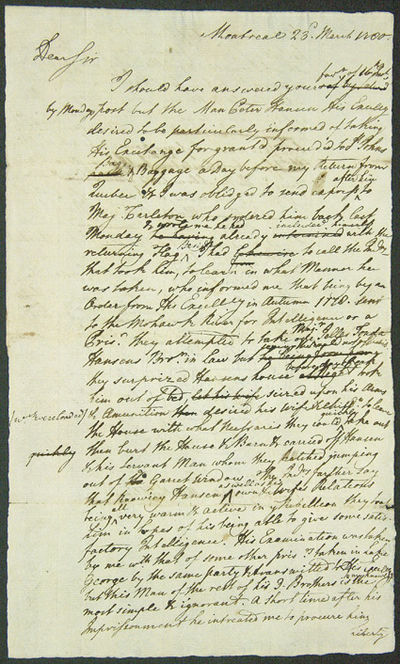 In this hurriedly written letter (probably the original draft of the letter, containing many manuscript corrections), which pertains to one Peter Hansen, "active in ye Rebellion," whom the Indians had taken for the British "for intelligence," Claus also mentions in an afterthought: "The Mohawk Village here is somewhat sickly within this short time. Kyststraekningen fra Rota til Kap Trafalgar indbefattende Cadiz Bay':. Headquarters, Robinson House [Garrison, N.Y.], 1780. Folio. Old fold lines. Minor wear and soiling, some separation starting at folds. About very good. General Benedict Arnold writes the day after receiving word that British Gen. Henry Clinton had agreed to his price for turning his coat. 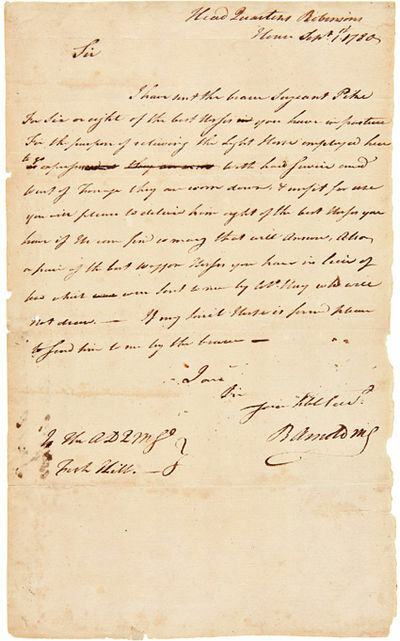 In this letter Arnold requests fresh horses to run express courier routes, some of which surely carried treasonous information to the British: "Sir, I have sent the brave Sergeant Pike for six or eight of the best horses you have in pasture for the purpose of relieving the light horse employed here to go express. With hard service and want of forage they are worn down & unfit for use. You will please to deliver him eight of the best horses you have if we can find so many that will answer. Also, a pair of the best waggon horses you have in lieu of two which were sent to me by Col. Hay who will not draw." The letter was clearly drawn up in some haste, as there are several words stricken through where Arnold has changed his mind about phrasing or information. In June 1778, Washington placed Arnold in command of Philadelphia, where he lived and entertained extravagantly, and his private business dealings, haughty and dismissive behavior, and close association with the Shippens and other quasi-Loyalists excited the enmity and wrath of the Executive Council of Pennsylvania. On Feb. 3, 1779 a courier served him with a copy of eight formal charges filed against him by the Pennsylvania Council. Outraged, Arnold demanded a court-martial to clear the allegations against him. "From this period began the plot that would end, eighteen months later, with Arnold's defection to the British side....He used those channels to inform General Henry Clinton, commanding the British army, that he was ready to serve the Crown. He explained to Clinton that he had lost faith in the revolutionary cause when the United States allied itself with France. No evidence before May 1779 supports this claim. Clinton was cautious but interested in the chance that Arnold might betray a key point in American defenses. He left the matter in the hands of young staff officer, John André" - ANB. By July, Arnold had named his minimum price of £10,000, and on Aug. 1 became commander of the critical American fortress at West Point. By the time this letter was written, important information was passing from Arnold to Clinton, and the plot to betray West Point was well advanced. A wonderful letter, hastily written and clearly showing Arnold's agitation as he slid deeper into infamy. [London, 1780. Sheet size: 31 1/4 x 23 7/8 inches. Minor age toning, minor chips at sheet edges, else very good. An important and quite scarce chart of the coast of Georgia and parts of South Carolina and Florida, as well as an important Revolutionary War battle plan. This fine chart is from THE ATLANTIC NEPTUNE, one of the finest large scale sea atlases of the United States and Canadian Atlantic coastline ever produced. The maps in the atlas were produce over a seven-year period (1775- 82), and are well known for their accurate portrayal of various sounds, bays, bars, harbors as well as navigational hazards. This atlas was used extensively by the Royal Navy during the American Revolution. This is a detailed chart of the Georgia, lower South Carolina and upper Florida coastlines, covering an area between the St. John River to John's Island. The towns of Savannah, Beaufort, Hardwick and Sunbury are shown and the coastal Parishes in Georgia are names. To the west is noted "Indian Boundary Line." With an inset titled "Plan of the Siege of Savannah, And the Defeat of the French and Rebels on the 9th Oct. 1779, By His Majesty's Forces under the Command of Major General Augustin Prevost. Surveyed by John Wilson A. Engineer." This is the third and most important state of the map. The very important feature of this state of the map is the large (7 3/4 x 11 7/8 inch) inset map showing the Siege of Savannah: "British defenses of the city delineated in detail, keyed by number to separate explanation sheet. The Rebel camp and French encampments are indicated as are lines of march and approaches for the siege" (Nebenzahl). A Londres, W. Richardson, 1780.Portables, et de ceux a grande Echelle, &c. IV. Un Essai sur le Feu Elementaire, & sur la Chaleur des Corps (avec la Description des Nouveaux Thermometres). V. Sur les Collections d'Instrumens (d'Astronomie, de Geodesie, de Physique, &c), ordonnees par la Cour d'Espagne. VI. Sur le Nouveau Remede de Mr. Mudge pour la Toux. 1780, Text in French, 4to, approximately 260 x 205 mm, 10¼ x 8 inches, 3 folding engraved plates as required, with the first unnumbered and the other two numbered V and VI as in all copies, 1 illustration in the text, pages: , 2,18, , 22 - 86, , 88 - 164 [i.e.166], ,166 - 192, ,194 - 258, some errors of pagination but the text follows on, collated and guaranteed complete, separate dated title pages for each tract (some of which had been issued separately), pagination (with breaks) and register continuous, at the end are bound 2 mathematical articles in English by Francis Maseres, taken from Philosophical Transactions of 1778 and 1780. Bound in modern quarter calf over marbled sides, raised bands with blind rules and gilt lettered morocco label, new endpapers. Very small pale red library stamp on title page, repeated 8 times within, plus a larger black ink stamp of the Inner Temple Library on the lower margin of last page of the English section at the rear, not affecting text, title page very slightly chipped at upper and fore - edge, pale age - browning to margins of a few pages, 4 pages heavily browned and fore - edges a little brittle, occasional slight foxing, mostly to margins, small light brown stain to 1 upper margin, small closed tear to 1 upper margin, repaired neatly, small chip to fore - edge of 2 folding plates, loss to margin only, small closed tears to a few pages due to being brittle, but not affecting text. A good tight copy of a scarce work. A reissue, with its own collective title page of Part 2 of the two - part collection with the same title and the imprint: A Paris & Londres, 1775 - 80. Part I contained information on the construction and use of sextant and octants and was not reissued. Usually known by the French version of his name, J. H. de Magellan (1723 - 1790), descended from the explorer Ferdinand Magellan, was a Portuguese scientist whose work focused primarily on scientific instruments. He is credited with introducing English scientific instruments, and the work of Joseph Priestley to the scientific community in France. After travels throughout Europe he settled in England in 1764 to pursue his scientific studies. He was elected a member of the Royal Society of London in 1774 and was also a member of the Imperial Academy of Science in St. Petersburg, and of the Royal Academy of Madrid. As an instrument maker and designer, supplying the governments of Europe, he proposed changes and improvements to astronomical and nautical observation instruments such as the quarters of a circle (English sextants and octants), in the reflection circle, in the sextant and in the pendulum clock. As far as meteorological instruments are concerned, he put forward improvements in barometers, thermometers and presented a meteorographer. As regards physical instruments, worthy of mention are his improvements to Atwood?s machines and to the precision scale, very important for the advances of chemistry. In Traite V in our book he deals with astronomic clocks and watches, marine compasses, protection against lightning, and the theodolite. The final Traite is actually an extract from a letter from Magellan to a doctor friend in Paris describing the construction and use of a new inhaler or respirateur invented by a fellow member of the Royal Society, the physician John Mudge, and believed to cure infallibly catarrhal coughs. See: Henry Sotheran, Bibliotheca Chemico - Mathematica, Volume 2, page 559, No. 11272; Dictionary of Scientific Biography, Vol IX, page 5. MORE IMAGES ATTACHED TO THIS LISTING, ALL ZOOMABLE. FURTHER IMAGES ON REQUEST. POSTAGE AT COST. JONES, John Paul (1747 - 1792). "Commodore au Service des Etats-Unis de l'Amerique". Hüftbild nach halbrechts des Schöpfers der US-Kriegsmarine, mit gezogenem Schwert stehend im Pulverdampf auf seinem Schiff "Richard", im Gürtel fünf Pistolen. - Schabkunstblatt von J. M. Will nach C. J. Notté, Augsburg, um 1780 30,5 x 23 cm. Founder of the US Navy. Contemporary portrait. Jones is standig on his ship "Richard", fighting against the "Serapis" under Capitain Pearson, during the famous sea-battle at Famborough Head, 12/22 1779. When Pearson asked him to surrender, he answered: "I have not yet begun to fight!". - Bis zur Plattenkante beschnitten. Kst.- Karte, v. Andre b. Bonne, "Carte de la Nouvelle Zéelande". - kol., um 1780, 34 x 23 (H) Frühe Karte von Neuseeland. Mit großer Windrose im Kartenbild, sowie 4 kleinen Nebenkarten von Buchten der Insel. 1) "Carte de Detroit de Cook", 2) "Bay des Isles", 3) "Baye de Tolaga" und 4) "Riviere de la Tamises et de la Baye de Mercure". - Tadeloser Zustand. London and Birmingham: G Robinson, and Pearson and Rollason, 1780 A very good copy of the 1st edition in new cloth binding, with large folding map of Spain, 6 full page plates (including the frontispiece), 2 folding plates and one illustration in the text. Dillon (1739-1805) traveled extensively in Spain and this book is drawn from his experience and observation, together with that of William Bowles, a naturalist, and 'other spanish writers'.There are useful descriptions of flora (including plant lists) and fauna and activities eg mining. In new plain cloth binding with new endpapers and 2 initial and final blanks. Contents: frontispiece of Charles III, King of Spain - from an original picture by Velasquez; title page; engraving of Minerva as part of dedication to Lord Grantham; Preface pp iii-vi; table of contents; large folding map by Dillon, engraved by Page; text in the form of letters with 4 full page and 2 folding plates; with colophon illustration at page 423; appendix in 2 parts pp 425-442; list of vegetables pp 443-448; table of contents pp 449-455; table of plants pp 456-459. The binding is in very good clean condition and the contents are similarly very clean and in very good condition. There is some offsetting from plates to text. Large quarto. A very good copy. um 1780 - Wasserrand rechts, der nur rückseitig stärker sichtbar ist. 1.100 gr. Théâtre à l?usage des jeunes personnes (Théâtre d?éducation). En 4 volumes. Paris, Panckoucke / Lambert & F. J. Baudouin, 1779 -1780, - in-8vo, papier frais, reliures en plein-veau, dos à nerfs richement ornés en or, tranches rouges. (reliure d?époque). Bel ensemble. Please notify before visiting to see a book. Prices are excl. VAT/TVA (only Switzerland) & postage. A narrative of a voyage to Arabia, India; &c; ...; with remarks on the genius and disposition of the natives of Arabia Felix; ...London, printed by William Glindon, sold by the author, . 8vo. With a frontispiece portrait of the author engraved by William Newman. Modern dark brown calf, gold-tooled spine. ESTC T139719 (8 copies); Mendelssohn I, 765; not in Blackmer; Gay, Bibl. de l'Afrique et l'Arabie. First edition, second issue (with a cancel title-page and an added list of about 160 subscribers) of a young man's detailed account of his adventures as a teenage member of the crew of a British transport ship in the years 1780 to 1784. He gives accounts of people, customs, food, animals and events in the places he visits, first the Cape, then up the African coast to the Arabian peninsula and on to Bombay (Mumbai) where he found his father, deserted his ship and lived royally for more than a year before he was captured and returned to his ship. On the return voyage he gives an account of Madagascar. He also gives a lively view of the rough and tumble day to day life on board the ship and of the cruelties of some captains.With an 1801 owner's inscription on a flyleaf. A couple sheets were under-inked on one side, but remain easily legible. With a small puncture hole through the first few leaves and occasional minor browning or foxing, but still in very good condition and only slightly trimmed. A very intimate view of a teenager's life and adventures sailing to Arabia and India. FREYSTADT. "Marianisch Wallfahrts Gotts-Hauß nechst Freystadt" usw. "Closter der P.P. Franciscaner" usw. Blick auf die Wallfahrtskirche Maria Hilf, darüber in Wolken das Gnadenbild, links Schafherde. Blick auf die Klosteranlage. Insgesamt zwei Darstellungen übereinander auf einem Blatt. - Kupferstich, i.d. Platte bez., sign. und dat. "1780 Supplevit F. Angelic. Dulln Fc. ", 41,5 x 34,5 cm. Der in der Legende erwähnte Bauherr Graf Ferdinand Lorenz Franz Xaver Tilly ließ die Kirche 1700-1710 nach Plänen von G.A. Viscardi errichten. Das Kloster entstand 1712-1714. - Geglättete Längs- und Querfalte, dort einige sorgfältig hinterlegte Papierdurchbrüche. NÖRDLINGEN. "Prospect des sogenanten Plazes bey der Hauptkirche St. Georg und dem Gasthof zum Wallfisch in Nördlingen". Blick auf die Front von St. Georg und die umliegenden Häuser. - Altkol. Kupferstich (Guckkastenblatt), Augsburg, um 1780, 27 x 41 cm. Nicht bei Schefold. - Seltenes, in der Kaiserl. Akademie in Augsburg erschienenes Guckkastenblatt. - Breitrandig, farbfrisch und gut erhalten. Carte Des Côtes De Malabar Et De Coromandel Presentée au Roy Par son très humble très Obeißant et très fidel sujet Guill. Delisle - Revue et Augmentée en 1780. A Paris Chez Dezauche Succeßeur des Srs. Delisle et Buache, Rue des Noyers près celle des Anglois. A.P.D.R. - A Paris chez l' Auteur G. Delisle Premier Geographe de Sa Majesté de l'Academie Rle. des Sciences au milieu de la Rue des Noyers. - A Paris Chez Dezauche Graveur, Successeur des Srs. De lIsle et Buache, premiers Géographes du Roi des Noyers. - Ph. Buache P.G.d.R.d.S. Gendre de l'Auteur Avec Privilege du Roi 1780.':. BJÖRNSTÅHL, JAC. JON. + ESPLING, OLOF. Resa til Frankrike, Italien, Sweitz, Tyskland, Holland, Ängland, Turkiet, och Grekeland: beskrifven af och efter Jac. Jon. Björnståhl. Efter des död utgifven af Carl Christof. Gjörwell [A travel to France, Italy, Switzerland, Germany, Holland, England, Turkey and Greece]. I-VI. + Minne öfver Jacob Jonas Björnståhl l.l.o.o. & gr. professor i Lund, samt ledamot af kgl. Vetenskaps-societeten i Upsala, och Upfostrings-sälskapet i Stockholm: uti sistnämnde sälskaps namn författadt [A memoir of Jacob Jonas Björnståhl .]. Resa til Frankrike, Italien, Sweitz, Tyskland, Holland, Ängland, Turkiet, och Grekeland: beskrifven af och efter Jac.